Well, today is finally the release of Isa Does It. But who cares? Here’s an amazing ice cream recipe! Yeah, maybe the days are getting colder, but I’ve always loved ice cream on a chilly day and who doesn’t want to eat everything pumpkin during autumn? Watch how easy it is in a new episode of Make It Vegan! We will get to the cashew base in a sec, but first things first: we want to prevent ice crystals. When you take a taste of the ice cream, you want undisturbed lickability without any disruptions, like scraping your tongue along a gravelly piece of ice. (Yes, I said lickability.) So a few of the ingredients are there to prevent that dastardly iciness. For one: a big dose of pure vanilla extract. The alcohol in it helps to prevent ice from forming. Plus, it tastes pretty darn good. And maybe you raised your eyebrows at the olive oil. Well the fat does a few things. 1) Prevents ice crystals. 2) Makes the texture creamy and rich. You need fat in ice cream. We’re not making sorbet here! 3) Flavor. Olive oil and pumpkin? That is music to your tastebuds. Next up: corn syrup! A bit of liquid sugar prevents iciness as well. And organic, non-gmo, beautiful amber corn syrup seems to do the trick best. If you need to replace it with agave or maple syrup, though, so be it! Now, about those cashews. Well, I use cashews in a lot of things, and it’s because they are as close to a heavy cream as a vegan can get. In this ice cream, I also boil the cashews instead of merely soaking them to soften. I tried it both ways (soaked vs boiled) and noticed that the boiled ones just created a better texture as well as neutralized any cashew flavor. Win win! I mean, cashews are delicious and all, but really, it’s all about the pumpkin here. And finally, rice milk. Why rice milk? Because it is one of the only commercially available plant-based milks without any thickeners or preservatives. I don’t want any tapioca starch or carageenan in my ice cream. Those ingredients also will affect the outcome of the ice cream. To keep things consistent, rice milk is best. Look for ones that only have a sweetener and a little salt. Those are ingredients we’re adding anyway. On the other hand, if you’re like “to hell with consistency”, you can use any plant based milk you like. OK OK, there’s a wonderful video here, so why am I even writing all this? It’s time for ice cream. ~To make your own pumpkin pie spice, it’s just 1 teaspoon cinnamon, 1/2 teaspoon ginger, 1/4 teaspoon nutmeg and 1/4 teaspoon allspice. ~I used regular old canned pumpkin puree, but you can really use any sweet winter squash. Try red kuri or butternut or kabocha, they are all delicious and easy to work with. Simply preheat oven to 425 F, hack the squash in half, scoop out the seeds and place cut-side-down on a lightly greased cookie sheet, and roast until easily pierced with a fork, usually around 45 minutes. Let cool, scoop the meat into a blender and puree! ~All ice cream makers are not created equal. I love my Breville Smart Scoop, and think it’s as close to a professional ice cream maker as a home cook can get. But read your ice cream maker instructions before using, because you may have to pre-freeze the containers, or some such thing. First, boil the cashews in water for about 30 minutes. Drain them and add to the blender. Add all remaining ingredients and blend until completely smooth. Blend for about a minute, then test for creaminess. It should take about 3 minutes total to get it as smooth as possible. Preset your ice cream maker to a hard gelato setting, and pour in ice cream mixture. Once churned, you can eat immediately as a soft serve, but for scoopable results, seal tightly and freeze for about 24 hours. This looks awesome! Isa–do you have a recommendation for replacing the cashews? My daughter is severely allergic to them, so I usually end up using coconut cream when I make ice cream, but it always makes everything taste very coconutty. Any ideas? Your new videos are great! Any suggetions for someone that doesn’t own the machine to stirr? Yummy! So appreciate all the explanations for why you used all the ingredients. I like to know the science behind cooking! I didn’t notice you add molasses in the video but it’s listed in the ingredients…should it be there? Your writing is so witty, descriptive, and engaging – and now the thrill of seeing your work on camera adds another fabulous dimension to the experience. I ♥ this video series! Can’t wait for the next one. Congratulations on your new book! (I’m anxiously awaiting its delivery!) 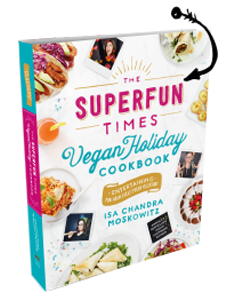 Thanks so much for all you do to make vegan eating a creative joy to prepare and gobble up. Can’t wait to try out your new recipes and add the new volume to my coveted Moskowitz collection. Looks ridiculously delicious. Love your site so much….everything is perfection. Thank you! Soo, I’m thinking of substituting a slightly reduced rosemary simple syrup in place of the corn syrup, as I’ve grown to love the pairing with pumpkin. Thoughts?! If not, I’ll break out the Karo syrup that was reserved for my now deceased diabetic cat. R.I.P. Brucie, this ice cream’s for you. thanks for all the great ideas, love your website and Facebook posts!! Your book just arrived in my mailbox, and it is SO gorgeous! Now if I can just decide what to make first. Love the videos too….you jumped off my cookbook shelf and into my kitchen! Congrats on all of it! I truly love all these videos lots! Nice little tat shot in this one. When I buy a (Breville!) ice cream maker, this will be my very first choice. Thank you for a non-coconut milk ice cream recipe, which seem to be few and far between, lately. Although I have loved coconut since I was a wee one–my fav childhood birthday cake included hand-grated coconut– I am not a member of the coconut mania currently taking over the world. Having lived in tropical, coconut-producing cultures for many years, and work in the health sector, I have learned to be wary of the very high–for a non-animal product-, especially- saturated fat content of coconut products (coconut ‘water’ apart, as it’s full of electrolytes to replace fluid loss through the continual sweating you experience in hot climates). Anyway, love this cashew-based recipe. I’ve been looking for a good cashew cream recipe! Can’t wait to try this! Holy crap I cannot wait to make this! I had some vegan pumpkin ice cream at Portobello in Portland recently and have been craving it ever since. Awesome video. I love the way you explain why you use this or that ingredient, like why rice milk and not almond milk, or why olive oil. Great! I am in love with Dairy Queen’s pumpkin pie blizzard and was just thinking this week about finding a way to make a vegan one. This looks like a winner! I’ll have to crumble pie crust in like they do at DQ. Making it the old fashioned / sans ice cream maker way… Freezing with intermittent stirring. The cream sure tastes good! Hope the final product turns out! just to update: i used this base to make a vanilla ice cream with chocolate ribbons. i left out the pumpkin, spice mix and molasses and added 2 vanilla beans (scraped) and melted some chocolate with a bit of coconut oil to drizzle into the ice cream machine in the last few minutes. it turned out pretty well and everyone said they liked it but since i had almond milk instead of rice milk i thought the final product tasted far too nutty. Maria – use the rice milk (it has a very neutral flavor)! I tried to also make this vanilla flavored but it does have a nutty background because of the cashews. I think this base lends itself to stronger flavored things like chocolate or pumpkin. I did notice that Neilsen Massey makes a vanilla bean paste. I bet that stuff would knock the nutty right out of this ice cream! You are the Bomb girl! My Vegan Hero! Thank you so much! What company makes your light molasses? I keep hearing about this product but can never seem to locate this elusive molasses. Can you recommend a substitute? Can I just use blackstrap? I made this for my husband who recently had to give up dairy. He loved it! He said he felt really happy that he could still have a creamy, delicious dessert without all the stomach pains. One more thing- I used Lyle’s Golden Syrup instead of corn syrup since that’s what I had on hand. That would be a good sub for anyone leery of corn syrup. Shut up. I need this in my life. Desperately. Cannot wait to make this!!! You guys ROCK. Is there way to do this without an ice cream maker? Thank you for the recipe! Does this work well in pop molds? I just made this, and it tastes fabulous and the creaminess is spot-on. My only complaint is that the spices add an unfortunate grittiness that distracts from wholehearted enjoyment, and I’ve noticed this with a similar pre-vegan recipe. I think next time, I’d heat the sugar in the rice milk first, with whole spices, then strain and cool before adding to the mix. I also found that I had to add rice milk to the cashews to get them to purée. I don’t know if this is because I’m using a Thermomix rather than a normal blender, though. I am allergic to cashews and all other nuts. Any suggestions on a substitute? Raw pumpkin seeds, perhaps? Made this recently. You should too. Nice pumpkin flavor, but not gross pumpkin dominance. Really was easy to throw together. I didn’t have corn syrup, so I used liquid sugar instead. Not sure how much that affected the ice cream, but next time I’ll use the corn syrup. Would love to see more ice cream recipes on PPK. Thanks for posting this pumpkin pie ice cream, especially with the video. Looks helpful. OMG!!!! So THAT is how you prevent ice crystals. I love you, Isa. Truly. If I weren’t married and straight I would propose. Isa – have you used this ice cream maker to make gelato and if so do you have any Gelato recipes? Love your cookbooks. Sooo I made this a few nights ago and wow, it was incredible! It is seriously like pumpkin pie in ice cream form. Thank you so much for this incredible recipe. And your video for this was entertaining, as always. 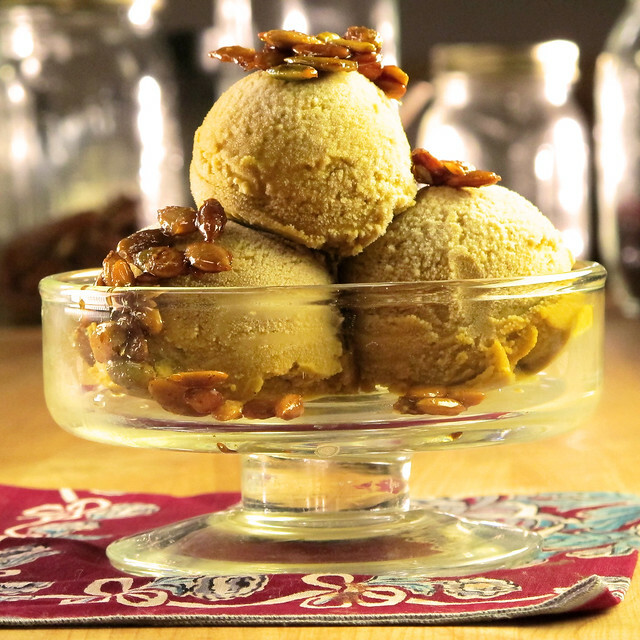 I’ve made vegan ice cream before, but never cashew-based. Now I never want to go back to making a soy-based ice cream again! The texture is so lovely. I made a batch with acorn squash and that was great, too. KeWhat other flavors can I make using this method? How many ice cream recipes are in your book? Thank you for being so awesome. I tried this recipe and it was great! Have you used the cashew-rice milk base with other flavor ice creams? Were the results equally delicious if you did? I was at the grocery in New York when someone helped me to look for a health product that no one else ever heard of. The person helping me mentioned you and your book. I was glad that they did. It is so frustrating to find real clean food with out the added chemicals and additives. I have looked at your videos and recipes and can’t wait to try them. Thank you for being a regular (lol) person. ps. Do you have any substitute for nuts in your recipes. Thank and Blessings. Thank you for your recipe in making pumpkin spice. I try not to use many things in cans. For your dried seasonings, which organic and natural brand do you use as most that I have looked at, has msg and added preservatives. Also, do you have a recommendation to replace the nuts and can I use brown sugar and sea salt. Thanks and Blessings. This sounds delicious. Is it possible to make it without an ice cream maker? My Vitamix is my only fancy cooking machine. I’m making your pumpkin ice cream even as we speak. I was intrigued with vegan ice cream after purchasing the Kindle edition of Vegan Scoop by Wheeler del Torro. His recipes for ice creams with no added fruit or purees like pumpkin were smooth and creamy. The ones with added fruit or purees, when frozen, were as hard as a rock. The arrowroot combined with soy milk and soy creamer helps to reduce ice crystals, but only for mixtures with no added fruit or purees. I’m thinking that your use of boiled raw pecans, olive oil, sugar and corn syrup would work well with soy milk thickened with arrowroot. I’m trying to make an all purpose ice cream base that would work with any flavors and ingredients that creates a smooth and creamy mixture while keeping it 100% vegan. Any thoughts? Oops on my last comment. I meant to say cashews, not pecans. This recipe lives up to expectation! I’ve made it twice now and have been super pleased with the results. A couple comments in response to a few questions here… I agree the pumpkin pie spice adds a bit of grittiness. The flavor, however, is spot-on–tastes just like pumpkin pie. The second time I made this, instead of pumpkin and pie spice, I made a simmered blackberry puree and the taste of cashew came through. I realized pumpkin masks the cashew flavor nicely. So, you will have nut flavor in your ice cream if you adapt the recipe, but, still, the texture and creaminess are amazing. I thought it tasted best after freezing for a day. It needs to churn quite a long time. Be patient with it and churn until it’s thickened, like softened ice cream. For the person who asked about a “fancy” machine, I use a cheap, small ice cream maker and it makes perfect ice cream. Worth the investment! Thank you Isa for doing all the chemistry experiments it must’ve taken to get the recipe right! I forgot to say I used agave instead of molasses because I really do not like the taste of molasses and as far as I know it didn’t affect the finished product. That is all. thast thing is maintained over here. has mordern elegance as effectively as vintage charm. seal. An outfit is incomplete without the need of correct add-ons. Hurrah! At last I got a blog from where I be capable of genuinely obtain valuable data concerning my study and knowledge. I’m a little late to this party, but just made this recipe & this is hands down the best ice cream I’ve ever made. The taste is amazing and the consistency is spot on. This is going to be a keeper. Fantastic. After googling and looking at all of these recipes for vegan ice cream and was like, “Do they not know about cashew cream?” Which of course led me to your site, since I make a lot of your food using soaked cashews, so happy to find this recipe to play around with for different flavors. Of course, I’ll have to make your pumpkin one first then start toying with it for other flavors. What are the measurements for the candied pepitas? Thanks! you have hit the nail on the head. The issue is an issue that not enough people are speaking intelligently about. A flapper is typically made of rubber, and it creates a tight seal at the bottom of your tank. Yes, that’s right, a good old fashioned pumice stone. of reluctance to exert any pressure on the injured area. Nowadays, this system has been significantly improved. about getting a substandard product at a substandard price. The recipe and video inspired me to buy an ice cream maker. It was an impulse purchase which I was mostly regretting until I made the recipe. Delicious! Three words: TO DIE FOR! I couldn’t stop licking the spatula and blender and ice cream maker attachments. Alas, I wasn’t going to actually have a serving of the ice cream because I am making it for guests. Can’t wait to dig in. I will be serving it over a vegan apple crisp. Oh yeah! Hey Isa, just wondering which type of olive oil did u use for this recipe. Is it the extra virgin olive oil? Oh my gosh, I just finished this and it’s amazing. I am trying to wait for my family to get home so I don’t eat it all without them. Thank you!! Paired this with your Pumpkin Streusel cake in Veganomicon for Christmas dinner….Wow!!! The texture is spot on. It’s almost gelato….rich, creamy, and smooth. Plus, it was super easy to make. Thanks Isa! Could sunflower or pumpkin seeds be used instead of the cashews? We have nut allergies in the family. Also, can brown rice syrup be used in lieu of the corn syrup? If so, will it affect the the flavor and creaminess?